Thousands of women from a cross-section of society came out in cities across Pakistan on International Women’s Day to be part of the Aurat March. One can recall how in 2018, several women, children and men took part in the march which was held in Karachi only. 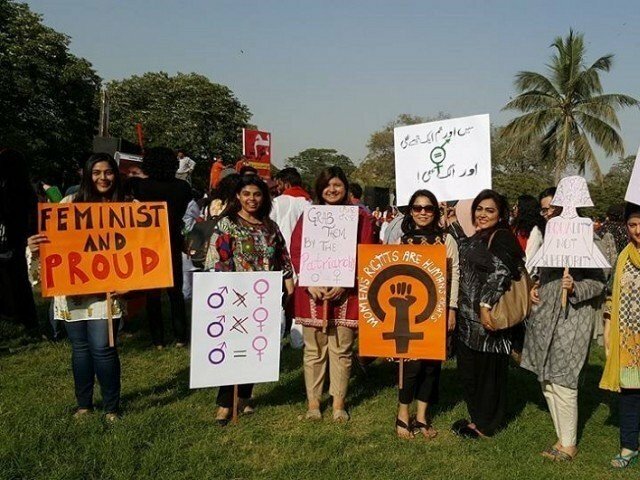 This year, the march has expanded to other cities such as Lahore, Islamabad, Hyderabad, Quetta, Peshawar and Faisalabad, as people from all walks of life joined the movement for gender justice. It was encouraging to see women turn out in such numbers. The rise in popularity of this march has been impressive. By all estimates, the rallies taken out by women all over Pakistan were a success. The organiser behind Aurat March is a women’s collective called “Hum Aurtein” who conduct community outreach programmes for women. To give some historical context, the march was first when a group of women decided to expand the feminist movement beyond what they said was the upper-class of society – this was a quote by one of the organisers to the media. In other words, a change not only of tactics but of focus. Here we see a difference of approach between the younger brand of women activists and those who fought the military dictators in the 80’s. Some say that they see a change in tactics while the fight is the same. Not really, insist others. The younger feminist movement, if it may be called that, while having being enabled by the older feminist movement of the 1980s, seems to be fighting for rights in a different way. My friend Nighat Dad who was one of the organisers of the Lahore March this year told the media that the older generation laid the foundation stones for the new feminist movement. Another organiser commented that the issues facing women today are about equality in public spaces, right to work, safety in the workplace, and most importantly, infrastructure support, while the previous generation fought for political rights. It is a thought-provoking comparison. Coming back to the march, possibly what makes it unique is that it is attempting to cut across social, political and other lines. This has been the case in the older movement, but the younger lots seem to disagree. This time round, they insist, some of the more evident participants were not for the elite. For example, the Lady Health Workers Association (LHWA) with a membership of about 90,000 women from across the country was one of the first to have endorsed the initiative. Possibly the Aurat March also suggests how the old guard is giving way to the newer generation of feminists and activists. Now to the highlights. One of my favourite aspects of the March were the illustrations done by Shehzil Malik, an award-winning illustrator based in Lahore, who created the artworks for the march. Many other illustrators came together to make their own versions of self-expression of women. This helped in producing the merchandise, if one may call it, for the event. For any successful event, good marketing and merchandising always plays an important role. The use of social media by both the organisers and the participants was also done quite effectively. Not only was the event highlighted beforehand but its coverage on the day was quite extensive. But here it seems the message may have been lost. The focus of the media as well as those on social media was not the message of the event but the opinions of those who were participating. While some of the opinions were inspiring, others were quite tasteless and in some ways counter-productive to the cause. But then again, one also has to understand that in this age of millennials and the Generation Z, the choice of words and how they are used are much removed from what I would expect and appreciate. After all, in the words of someone I know, this wasn’t my event to begin with. Or was it? The appeal of Aurat March should be for all persons – irrespective of age, gender or origin, who believe in women rights and equality for all. It is hoped that the initiative continues and thrives in years to come. Let us move beyond slogans. Time for some real action in days to come. Published in The Express Tribune, March 11th, 2019. Can Pakistan and India face the bitter truth?